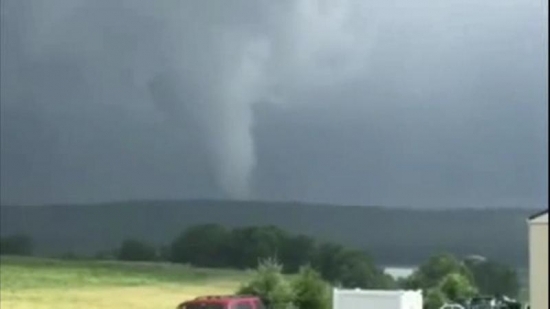 The National Weather Service has confirmed a tornado near Honey Brook, Chester County on Tuesday. The EF-1 tornado hit at 2:11 pm with estimated maximum winds of 95mph. It had a maximum width of 100 yards and travelled 1.5 miles. They assessed damage along Talbotville Road up to Morgantown Road. Several homes were damaged with roofs ripped off. The damage was minimal though. The Amish were out helping neighbors with the cleanup and rebuild. Up north, NWS officials say that it was straight line wind damage and not a tornado that hit in the Lehigh Valley. Philadelphia Police are looking for a serial burglar who has robbed six different businesses over the past two months. The man has victimized a variety of establishments in several neighborhood including Girard Estates, Point Breeze, South Philadelphia, Chinatown, and Washington Square. The first burglary was on May 12th at a Cricket cell phone store on Snyder Avenue. The last happened on Friday at Paolo Pizzeria on Pine Street in Center City. He has also robbed two Chinese restaurants, a Rita's Water Ice, and Flying Fish Seafood. The police have released surveillance video of the suspect. If you recognize the bandit contact Philadelphia Police.